I suspect that if Charles Dickens were alive and was going to write fantasy for kids – he might well conjure up something like this. Wonderful eccentric characters, with names such as Mrs Parsnickle, or Ad and Tad, or even The Naysayer, who lives in a crazy jagged frozen tower at the very edge of the Stream. Absurd situations abound and there’s no stopping for tea – no time to waste in the urgent search for ‘The Map to Everywhere’. I was a big fan of ‘The Forest of Hands and Teeth’ – picking it up because it read like literary fiction and to my infinite surprise discovered it was a zombie novel – a damn fine zombie novel. Be aware that Carrie Ryan and husband have done their homework and this is not written in the same style and aimed fair and square at the 9-year-old kid who loves a mystery, a challenge and magic – not to mention weird names, an orange cat, talking forests and ghost ships. We begin by meeting Fin; the most forgettable orphan in the world – who indeed has been forgotten by the very same orphanage his mother deposited him in, aged four. He now has a secret life as a Master Thief and being utterly forgettable makes it easy for him to get away with everything. He is not mean or nasty. Indeed he steals back the very items that the orphanage is hocking to keep the place open. A good thief then – but almost invisible and has no friends. Marrill is completely different, a vivacious, life loving schoolgirl who cares for everyone, animals especially, stuck in Arizona awaiting the next family adventure. Sadly for her she finds out her mother is sick, very sick and they are going to be stuck in Arizona for a very long time. Upset she grabs her cat and runs off only to encounter a pirate sailing ship, The Kraken, in the abandoned shopping mall car park. (Which is technically impossible to her way of thinking) It’s crew includes an ageing wizard, a large thuggish looking Captain and pirats, actual rats who seem to be running the ship. 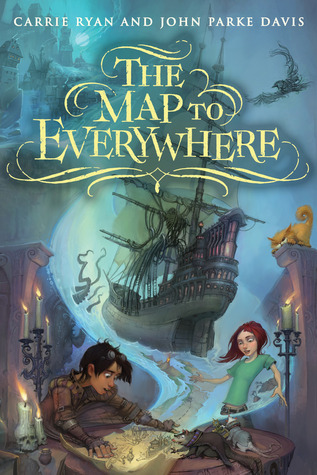 They are all looking for a map, or at least a part of a map and Marrill admits she may have seen something like it floating in the lake and before she knows it Arizona has vanished and she is in the stream – a secret ocean and collection of rivers that could not possibly be part of this world – yet is. Marrill is smart and sassy and everyone takes to her, but she hopes that she can persuade the wizard to come back to her house to cure her Ma. If only they could find their way back, which might actually be impossible given the stream isn’t exactly ‘fixed’. How Marrill eventually meets up with the flying Fin, who is fleeing the crazy Oracle who makes grown men weep, and finds a life of extreme adventure is all crammed packed into this amazing fun-filled volume. The hardback will be illustrated and will be the best book you could possibly buy any kid who loves adventure this year.